When you need cleanup and restoration services FAST, contact CCS Cleaning and Restoration, Southern Minnesota's leading certified cleaning agency. Whether you need to schedule an annual deep cleaning or emergency restoration services, we respond quickly to your call for help and provide expert top-to-bottom cleaning for homes and businesses. Disaster can hit your residential or commercial property at any time. Don’t wait for the damage to threaten the value of your home or the revenue of your business! We are committed to providing the highest level of customer service and quality services in a timely manner at the best competitive price. When you’re dealing with certain types of damage, such as water damage, mold, or a biohazard, there’s no time to waste. That’s why we offer round-the-clock emergency services Monday through Friday, 365 days a year. If you need immediate assistance, call us as soon as possible, and we will make sure your cleaning and restoration needs are addressed as soon as possible. Customer care is our top priority! As a leading certified cleaning agency with nearly 50 years of combined on-the-job experience, our team is the area's most seasoned carpet cleaning professionals. Over 50 years of combined professional carpet-cleaning experience with all types of carpet and fabrics. Minnesota interior designers, real estate agents, and homeowners exclusively refer our cleaning services. We are certified by the world’s most recognized body for certification of carpet and upholstery cleaners, Clean Trust (Formerly IICRC). It is recommended to never use a cleaner that is not certified. We are committed to first class customer service. It is only by treating you, your home, your business, and your belongings with the utmost respect that we are performing our jobs to the fullest. Along with that, we welcome your cleaning questions and are happy to provide stain removal suggestions and techniques. We offer the most advanced cleaning technology on the market today, using top-of-the-line systems that do not over-wet your carpet or leave behind a sticky residue. At CCS, we offer a 100 percent money-back guarantee. If you are not completely thrilled with the service you received from us, we will return to your home or business immediately, and correct any remaining issues free of charge. If you are still unimpressed, we will issue a complete refund. Don’t trust your property to just any cleaning service. 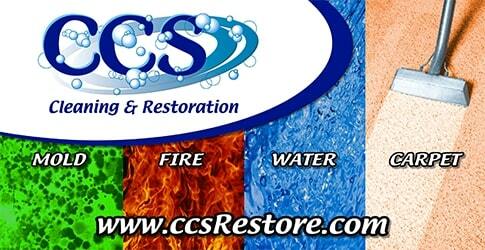 CCS Cleaning and Restoration is proud to be bonded and insured. Whether you operate a bustling business or a hectic household complete with kids and pets, our customer-oriented cleaning technicians can work with you to provide the deep-cleaning services you need. Get a free quote now!